MacGregor's three-axis motion compensated offshore crane has won the Offshore Support Journal's (OSJ) Innovation of the Year award. The news was announced at OSJ's fifth Annual Offshore Support Journal Conference and Awards event in London, UK, on 19 February 2014, and the award was presented to MacGregor's Offshore Advanced Load Handling team in front of an audience of over 500 people at the conference's gala dinner. The award is given for a product, system or service which is judged to have made the most significant impact on the design, build and/or operational aspects of offshore support vessels. "It is an honour to receive such a prestigious prize from one of the most reputable forums in the international offshore sector," says Tom Svennevig, Vice President, Advanced Load Handling. "It is also an important recognition of our capabilities from peers across the offshore industry." "In 2012 we also received the OSJ Innovation of the Year award; on that occasion it was for our Chain Wheel Manipulator," Mr Svennevig continues. "Winning it for a second time is especially remarkable, particularly in the face of such notable competition from the shortlist of nominees in the category." This crane is a first-of-its-kind, not just for MacGregor, but for the offshore industry as a whole. MacGregor was approached by Siem Offshore to develop an innovative type of crane for its newbuild infield support vessel Siem Moxie. The crane will be delivered to Siem Offshore in March 2014. The vessel will operate in the offshore renewable energy markets, carrying out installations, repairs, maintenance and general service duties. One specific task for Siem Moxie will be to transfer containers of tools and equipment to the top of offshore windmill foundations. 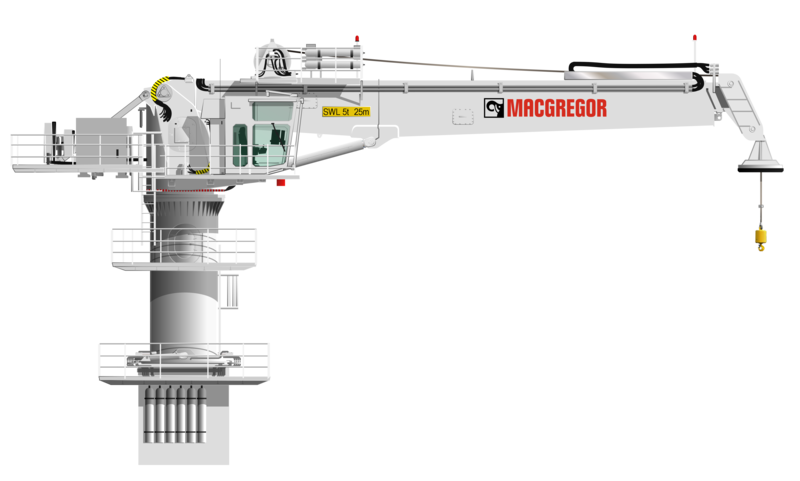 "MacGregor's standard active heave-compensation technology supplied though a crane's winch compensates for a vessel's vertical movement, assuring accurate load handling. However, when transferring equipment to the top of offshore windmill foundations, which are about 20m above the water and are only 4m2, even more precision is required," explains Baard Alsaker, MacGregor R&D Director, Advanced Load Handling. "As a result, our engineers developed new technology that compensates for vessel movements in the horizontal plane (pitch and roll) as well as in the vertical plane. Compensating for the horizontal motions ensures that the crane's pedestal remains vertical in relation to the seabed, so that it will always be parallel to the windmill structure. Thanks to this three-axis compensation, the crane can perform extremely accurate load positioning operations. The crane can be used for a variety of other purposes, including ship-to-ship operations. It can also be specified for certification for personnel lifts, further enhancing its flexibility." He notes: "We see that the emerging offshore wind sector continues to set new requirements for offshore cranes and we are constantly looking for ways of employing our expertise in the development of innovative new solutions for our customers." Caption: MacGregor's three-axis motion compensated crane employs new technology that compensates for vessel movements in the horizontal plane (pitch and roll) in addition to heave compensation in the vertical plane. Compensating for the horizontal motions ensure that the crane's pedestal remains vertical in relation to the seabed, so that it will always be parallel to the windmill structure, allowing the crane to perform extremely accurate load positioning operations. The Annual Offshore Support Journal Conference and Awards is one of the most prestigious international forums for shipowners, senior offshore support executives, shipbuilders, designers, classification societies, industry associations and equipment manufacturers. It brings together all stakeholders in the global offshore support industry. Baard Alsaker was a member on the advisory panel and also gave presentations at OSJ's Offshore Wind Forum and Subsea Focus Forum 2014.